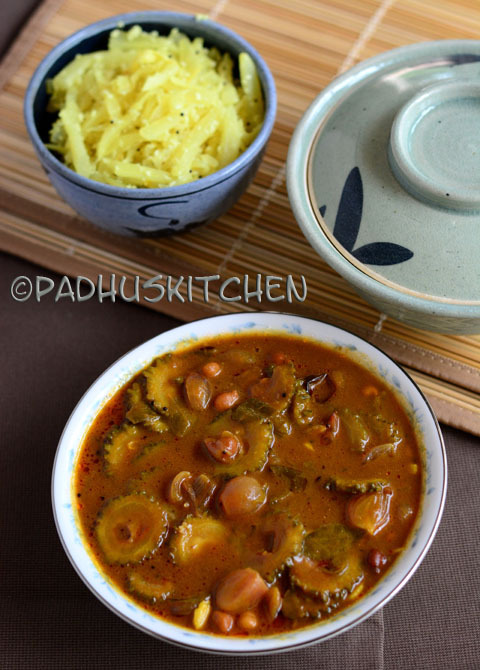 Pavakkai Puli Kuzhambu is another classic South Indian Spicy Kulambu made with bitter gourd / bitter melon. Bitter gourd is know as pavakka in Malayalam, pavakkai in Tamil, karela in Hindi and kakarakaya in telugu, haagalkai in Kannada. Bitter gourd has many health benefits and is considered to be good for diabetic patients. Many do not like bitter gourd because of its bitter taste but if cooked properly, it will be very delicious. I personally love bitter gourd and include it in my diet frequently. Today we will learn how to make bitter gourd/pavakkai puli kuzhambu following this easy recipe with step wise pictures. Wash and cut bitter gourd into thin roundels. It should be thinly sliced as we are not going to cook it separately. If the seeds are tender, you can use it otherwise discard the seeds. Soak tamarind in a cup of hot water for 15-20 minutes. Extract its juice (around 2 3/4 cup of tamarind extract) and discard the pulp. Peel shallots and keep it aside. If it is big, cut it into half. Wash and soak chickpeas overnight. Pressure cook with a pinch of salt for 4 whistles or until soft. Heat oil, add mustard seeds, when it splutters, add fenugreek seeds, red chilli and hing. Then add shallots/pearl onions and curry leaves. Saute until onions turn transparent. Then add bitter gourd and cook well in oil (about 5 minutes on medium heat). This will remove the bitterness to some extent. Saute for a few seconds and then add tamarind water. Add cooked chick peas. When the tamarind water starts boiling, reduce the heat to medium. Let it boil until the tamarind water reduces and thickens. Once the gravy reduces and thickens, remove from heat. (Picture below shows - after 15 minutes of boiling on medium heat). Serve with rice and any vegetable curry or stir fry. Storage and Shelf life - Leftovers can be stored in a stainless steel container in the refrigerator. It stays good for 3-4 days in the refrigerator. Note - I have used Homemade Sambar powder which is not hot. If using store bought sambar powder, use a little less. Sesame seed oil gives a nice flavor to the kuzhambu, so I recommend using sesame seed oil (nallennai). The only mistake you can do in this kuzhambu is adding too much of tamarind. That is the reason, I have given an approximate measurement of tamarind. The sourness depends on the variety of tamarind used. So if you feel, your tamarind is sour, add a little less than mentioned. You can make this kulambu by substituting bitter gourd with butternut squash or yellow pumpkin following the same procedure. No reason .It tastes good and is more healthy. Bitter gourd is one of my favorite vegetable. I tried this recipe but I baked the vegetable slices until lightly crisp. I bet you it took the kuzhambu to another level. Do try it. Great fan of your blog. What is the delicious looking yellow poriyal in the photo? Thanks Fathima. That is Radish Poriyal Yes, it will be very delicous.Do try it. Even those who hate radish will love this poriyal. It tasted like my grandma's puzhi kulambu. Thank you. Thank you Mrs. Padhu Sankar. Please keep up your great work. Thanks for the recipe... I tried it and it came out very well. It was yummy thank you so much..